The mighty GlaGla Race wasn’t considered a top 15 race last year. It probably should have been. I built the SUP Racer World Rankings six years ago. I had the idea even before I had this blog, scribbling down notes as far back as 2010. I started working on the current system in 2013, and a year later – on the eve of the infamous Battle of the Paddle @ Salt Creek – I launched the World Rankings for the paddling world to enjoy. It’s definitely been a labour of love: The system took over a year to build and I’ve spent another 2,500 hours maintaining it, while the master spreadsheet now contains a mind-boggling 2.6 million cells of data (my eyes hurt just thinking about it). It’s been fun. I’m a stats geek at heart, and the World Rankings have been my contribution to the sport – it’s been rewarding to see these numbers have a genuine impact. Over the years, the SUP Racer World Rankings have helped define the season and shine a spotlight on deserving athletes. But while everyone sees the athlete world rankings (and the spin-off brand rankings), there’s another “leaderboard” hidden below the surface that’s also had a big influence: The Race Index. When I was creating the SUP Racer World Rankings six years ago, I quickly realised our sport needed a method of accurately ranking events before we could ever accurately rank athletes. Without any legitimate world tour or governing body, my solution was to write an algorithm that accurately scored each standalone event. Basically, the Race Index uses a mathematical formula to determine how competitive each event is. The more competitive an event, the higher its Race Index score and the more world ranking points on offer to the athletes. The Index is based purely on elite participation: The more top-ranked athletes on the start line, the higher the Race Index. And the better an individual athlete’s world ranking, the more weighting they’ll contribute to an event’s Index score. Sounds complex (because it is) but the result is simple and easy to understand: Every race gets scored from 0% to 100%. For context, most local and regional races score under 10% while the Battle of the Paddle peaked at around 95%. Everything else is somewhere in between. The table below is how it looked in Season 2018. Interestingly, last season was the first time the BOP/PPGs wasn’t number one (congratulations Gorge Paddle Challenge). From 2008-2017, the big weekend in Doheny was by far the most competitive race of the year. But the PPGs has been dealing with an inevitable decline (nothing stays on top forever), and these days it’s a big achievement for any event to break 60%. The old Race Index was built from scratch. Pro golf uses a similar system, while the chess world rankings have a few commonalities, but the Race Index is original and unique. I also created a custom “Base Points Table” (100 points for 1st, 75 for 2nd, 60 for 3rd and so on) after studying the points systems of 11 other sports (from tennis to surfing to nordic skiing). This table, combined with the Race Index, produces the specific world ranking points awarded to each finisher in every international race. And that’s how the World Rankings are made. I won’t bore you further with the details (I’ll happily write a thesis if anyone is interested), but I think it’s worth providing a little background so I can explain the current landscape of the sport. 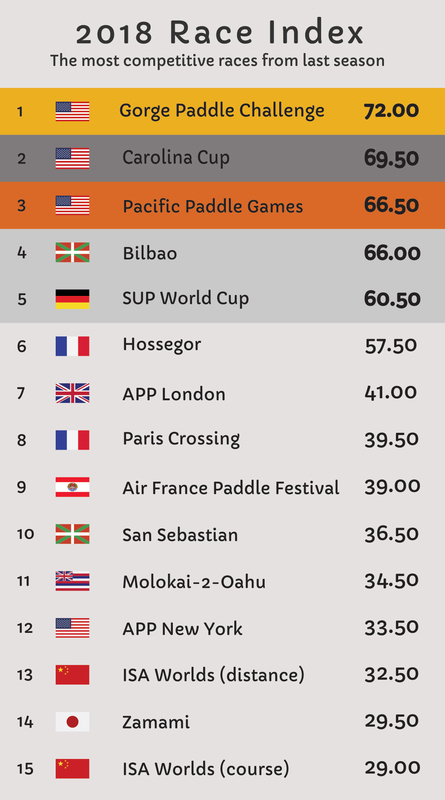 Last year we spun-off the SUP Racer World Rankings into The Paddle League. The rankings have evolved every single year (remember “Star Ratings”?) but last year was the big leap — what was once a straightforward leaderboard was now a world tour. This world tour format had many positives (for one, it was simple to follow) but also a few negatives that I never liked: Some events were being excluded, which impacted accuracy, while I was becoming increasingly disillusioned that my own creation was failing to reward many races that do so much to grow our sport. Events that attract hundreds of amateurs and juniors are extremely valuable to the growth of our sport, but because the Race Index only considers elite participation, “mass participation” races are often forgotten. Which is just not right. Now don’t get me wrong, I believe the “traditional majors” such as Carolina and the Gorge deserve to be right up at the top. They’re fantastic events that act as pillars for our sport. This isn’t about penalising the current top events, it’s about rewarding those races that are currently under-valued. For example: Where’s Chattajack on the rankings? How come Brazil’s big Aloha Spirit Festival was never really on the radar? And why does the 500-strong GlaGla Race score lower than some other events that have nothing more than a few elite paddlers participating? None of this would be an issue if the Race Index was a purely-statistical analysis of the world’s top paddlers that had no influence on the sport. That was actually my original intention, but then the system took on a life of its own. Now the system does have an influence. An outsized influence. Because of this influence, I think SUP Racer and the Race Index have contributed to our sport’s unhealthy obsession with the top 1% while ignoring several other factors that make an event (and the wider sport) truly great. In short: The system I built is flawed. So that’s why I’m building a New Race Index. …actually, it’s already built, and later this week I’ll reveal it. This “New Race Index” coincides with a major overhaul of The Paddle League, which itself was born directly from the SUP Racer World Rankings. That news will be announced in a few days, but essentially: The Paddle League World Rankings (the new home of the SUP Racer World Rankings) will become more open and accurate. The World Rankings will be more “unifying,” in the true spirit of the original system, while we’ll introduce new elements that hopefully help push the sport forward. One of those elements is the New Race Index, which will reward both elite and mass participation — plus other criteria, including recognising events with exceptional media exposure that helps grow our sport. 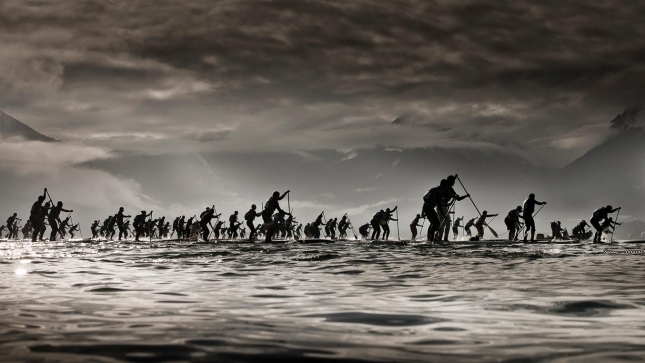 This “New Race Index” will power The Paddle League and several new regional leagues. We’re also transforming the overall World Rankings into an open platform — it’s not just an elite club like the old SUP Racer leaderboards were. I’ve never really highlighted this point, but the 2018 Paddle League World Rankings featured 1,926 individual competitors. I think that’s a major contribution to the sport as it makes all paddlers feel like they’re part of our sport, not just the 1%. The Paddle League is for everyone. This unifying manifesto, along with the New Race Index, will see more than 3,000 paddlers feature on the World Rankings in Season 2019 (based on my early calculations). It doesn’t matter if you’re world number one or #1001, we’re all part of this sport. So check back tomorrow for more details, and in the meantime take a look through the Men’s World Rankings (1,474 paddlers) and the Women’s World Rankings (455 paddlers) from Season 2018. Buckle up: It’s going to be a fun season!